For those of you who aren't familiar with Clotilde Dusoulier, she is a Parisian food blogger and author extraordinaire who has been writing the blog "Chocolate and Zucchini" for 13 years now (not to mention her other numerous contributions to the food world). Back in 2009 on a 2 week trip to Paris Steve and I used Clotilde's book "Edible Adventures in Paris" as our sole guide for all things food related - restaurants, bistros, boulangeries, pâtisseries, épiceries, chocolateries etc. Each spot we either visited or dined in was absolutely up to par, and nary a disappointment in the bunch. I've also emailed Clotilde a couple of times over the years with various questions, and she has always replied promptly and cheerfully. Whenever we see her picture, we think of a pixie - smiling and friendly. Sooooooo . . . . . When we decided to make this trip to Paris, we thought what better time than to meet Clotilde in person. 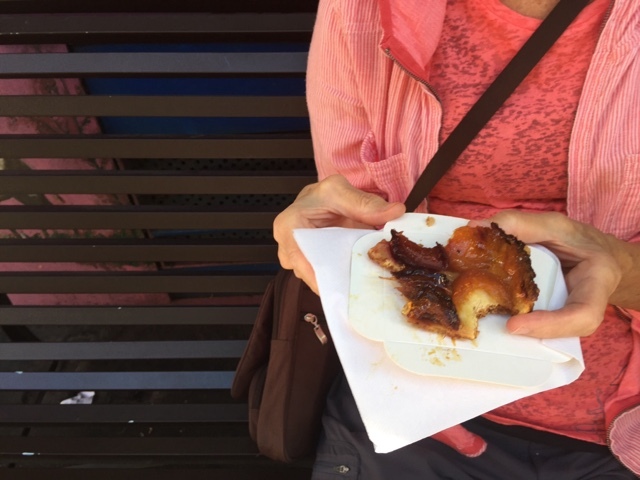 We booked a two hour food related walking tour of Montmartre with her, and here's the story. We met her at the Abbesses metro stop and set out from there down rue des Abesses. At various stops Clotilde purchased goodies for us to sample. Nice. 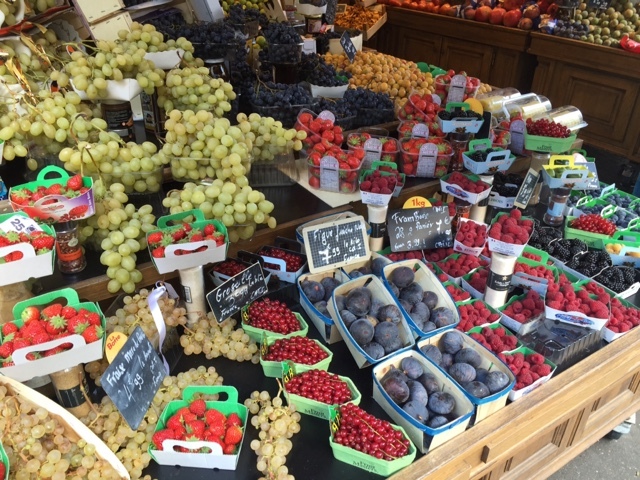 Our first stop was a fruit and veggie vendor where everything was set out artistically, full of color and variety. We tasted fresh green and purple figs - perfectly ripe, as sweet as honey and oh so good. 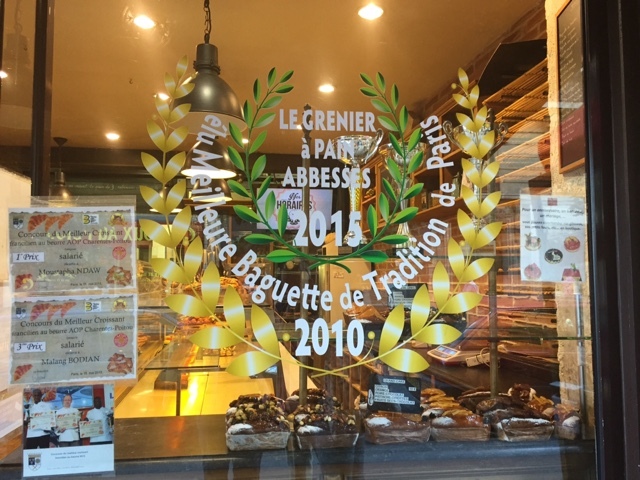 Our next stop just a little way down the street was a boulangerie/pâtisserie that has won the "best baguette" or meilleure Baguette de Tradition de Paris competition not only once, but twice! It turns out each year's winners can't compete again for four years, so after a win in 2010, the chef entered again in 2015 and won a second time! Pretty unheard of according to Clotilde. 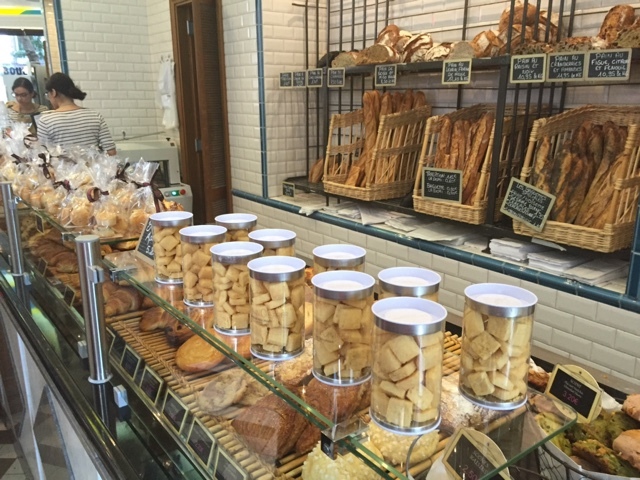 We sampled one of the baguettes and experienced a just-right crisp crust, an open almost buttery interior with a certain softness (NOT doughiness) to the crumb (you had to be there!) and a delicious, natural flavor. 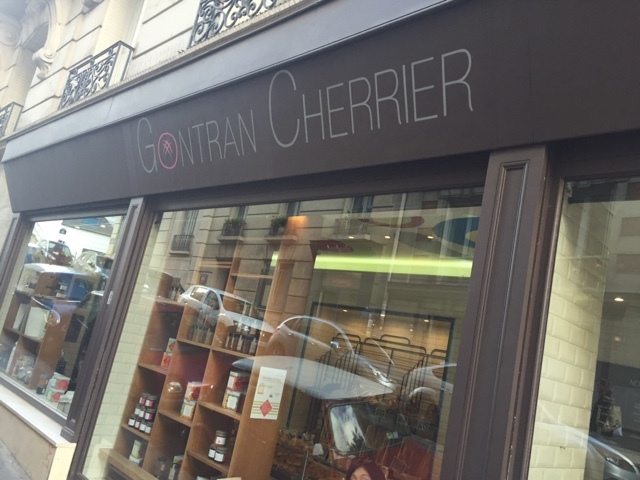 From there we wended our way over to rue Caulaincourt and the pastry shop of Gontran Cherrier. 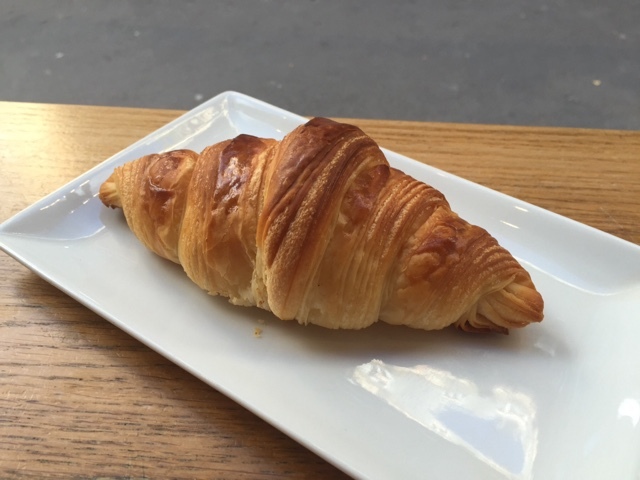 M. Cherrier holds the prestigious honor of winning the meilleur croissant de Paris award and so, of course, we had to sample one of his croissants absolument! I'm not quite sure how to describe this. Perhaps because I've spent so much time researching croissant recipes, trying different butters, tweaking my folding techniques and resting times and sampling different finished products, my mind has become cluttered with the characteristics of a really, really good croissant. For me, there has to be that cascade of crispy shards from the exterior as you pull it apart or bite into it. The interior should be buttery, but not too, with a texture that's a cross between bread and flaky pastry, with perhaps a hint of chew but not too dense or heavy. 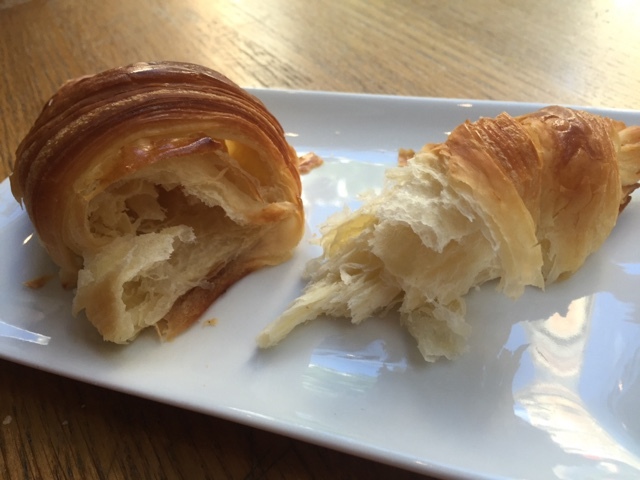 This croissant had beautiful, well defined laminations and a delicious flavor, but the exterior didn't have that shattering shard quality and the texture seemed just a tad dough-y to me. But who am I to say? Nonetheless, Steve and I finished it off with aplomb. 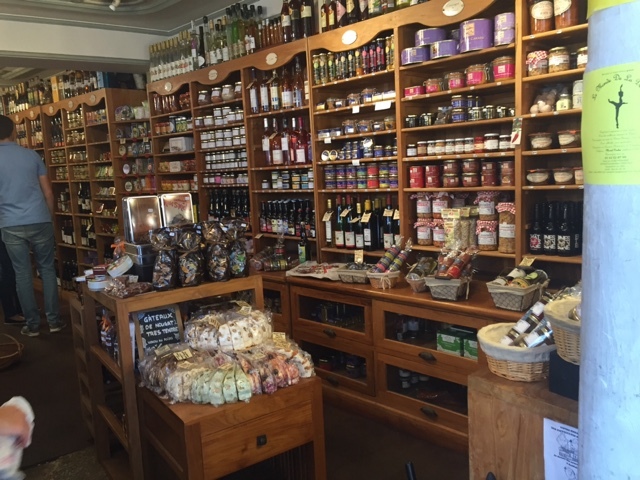 We meandered back to rue Lepic where we visited L'Épicerie du Terroir, a shop full of all sorts of food goodies - oils, herbs, spices, specialty salts, peppers, nougats, mustards, jams and on and on and on. Clotilde suggested that this is a great place to pick up food gifts to take back home, however we weren't in the market for anything in particular so we simply looked and savored the possibilities. 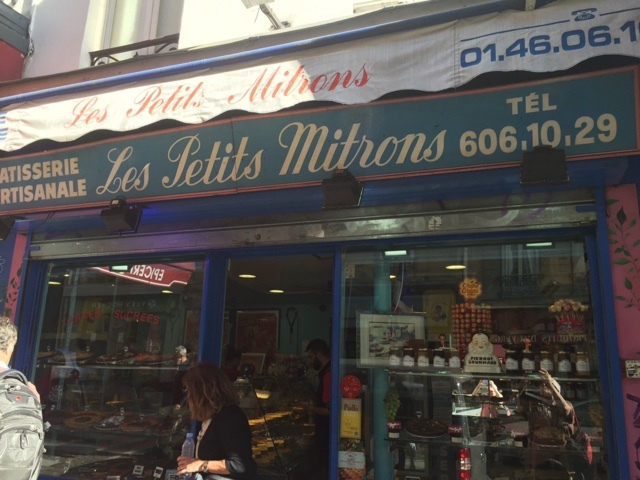 Right next door was a fascinating tart shop, Les Petits Mitrons, full of rustic, simple tarts. Unfortunately they didn't allow photos to be taken inside the shop, and the glare of the sun on the front window made it impossible to get a decent photo from outside. Bummer with a capital B!! We did have a slice of the apricot-plum tart - basically fresh fruit baked on a sablé crust which is somehow coated in sugar and caramelized. Clotilde is working on figuring out just how they accomplish this feat. I'd certainly like to know! Alas we'd already taken a few bites before Steve snapped this photo. Delicious! Throughout our strolling and tasting we chatted about various things, including my love of shortbread and tarts. 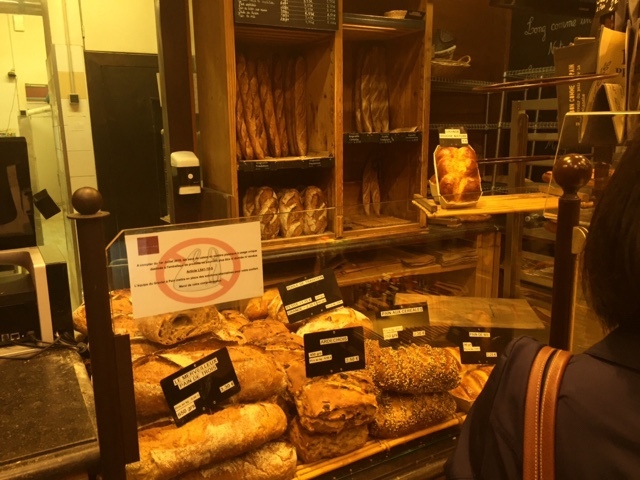 We were getting close to the end of our tour so Clotilde gave us the option of visiting a fromagerie vs. a biscuiterie (cookie shop for you English speakers). 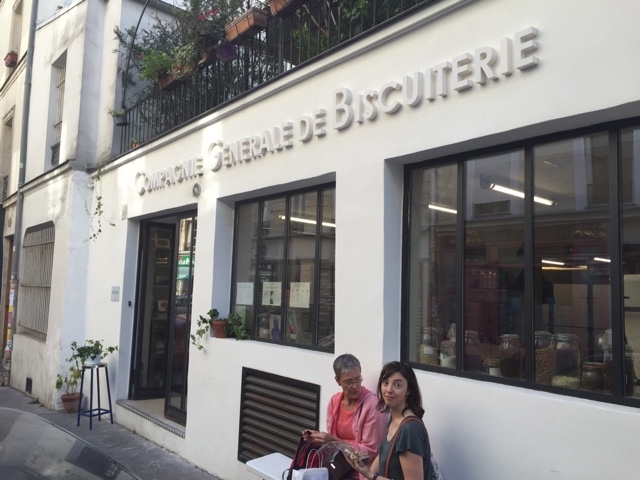 Of course I was all for the second option, so off we went to the relatively new shop of Gilles Marchal known as Compagnie Générale de Biscuiterie Montmarte. Now that's a mouth full! 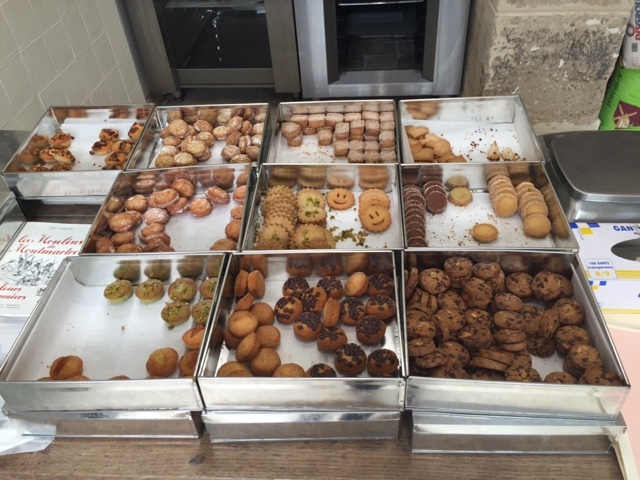 We chose an assortment of delightful sablés, financiers and palets Bretons which were displayed simply in cookie tins. One can buy mix and match flavors starting at a minimum of 100 grams (about 14-15 petite cookies) in a cellophane bag or choose a larger assortment lined up nicely in a tin. The shop also has other types of biscuit already packaged up for sale - arlettes (caramelized puff pastry crisps), dacquoise, macarons rustique to name just a few. This place is right up my alley. After sampling just a few of our biscuit it was time to say goodbye. We gave Clotilde our hearty thanks, strolled down rue Lepic to the Blanche metro stop and headed back to our apartment. We thoroughly enjoyed our time with the Parisian pixie from Montmartre. Thanks so much Clotilde!